I still use MX ver 4.4.1.300. The reason is the video fast forward button, which I love. 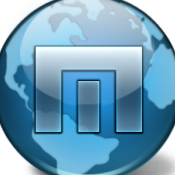 I do understand why Maxthon removed the button and will not include it in future releases. I'm writing this to find out if its possible to copy the specific DLL of the video player from version 4.4.1.300 to the latest version of Maxthon. If yes, then what is the specific DLL? This will allow me to be on the latest Mx Version with the feature I need, without making Maxthon liable to any trouble. I'd guess that there's more to it than just copying over a DLL. And for that reason, even if you could do that the chance of it working would be slim to none. Why use oldest version with Fast forward button? There are also versions 4.4.1.1000 and 4.4.1.2001 with this function. can i ask why they dont include it in new releases?. They were receiving flack from the video sites.